Chabad of Fresno caters and nourishes the body as well as the soul! 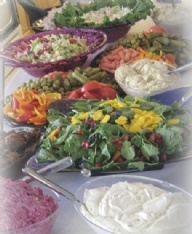 Chabad of the Central Valley Catering was founded with 1 goal in mind - To offer quality Glatt Kosher food at great prices. Our fresh tasty food accompanied with our warm friendly service can ensure that you have a hassle-free and tranquil catered event. All foods are prepared with the freshest ingredients by Chanie Zirkind. From an early age, Chanie has been involved in food preparation. Her great knowledge of culinary arts comes from her experience working in the catering business. Chanie is known throughout the world for her delicious cooking.